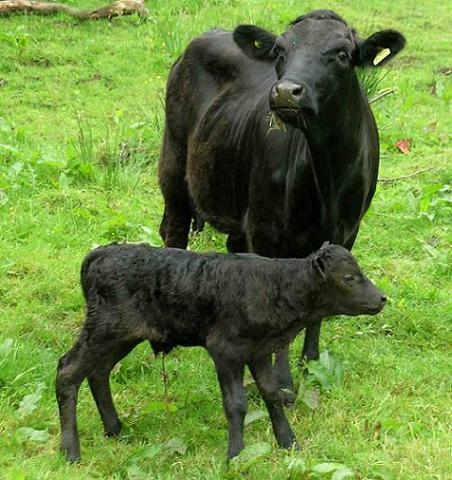 The current breed of Dexter cattle were brought to England from Ireland in the late 1880s, and are the smallest native British breed. They are a dual purpose animal, producing a rich, creamy milk, as well as superb well-marbled beef. The cattle are a hardy breed, known for their longevity, and can live outdoors in all but the worst of winter weather. They were on the Rare Breed list, but the success of the breed as “the smallholder’s cow” over the past two decades has seen them move on to become a minority breed. Dexters come in three colours - black, red and dun – with black being the predominant colour. They are also classified as “short” or “non-short”, largely depending on their leg length. Dexters are good-natured and easy to handle. They are slow to mature, and to get the best out of them as beef cattle they stay on the farm until around 30 months to 3 years old. The Skerry Herd was formed in 2004. All the cattle are reared traditionally, the calves staying with their mothers for around eight months. They are primarily fed on grass on our sloping fields overlooking the sea, and on hay. Our animals are predominantly non-short and black, but we have a few red ones and the odd "shortie". Our bull, Goldenberry Thunder, carries the polling gene, which means that many of our calves do not have horns. Although we have reduced the herd over the past two years, we have fresh beef available regularly and frozen meat is almost always to be had. We use a small Yorkshire village abattoir for the slaughtering, butchering and packing of our beef. The carcases are hung for almost a month to give meat of the highest quality. It is a good rich port red colour, not pale or scarlet like mass-produced (and fast - produced!) supermarket meat. For convenience of handling and storage our beef is vacuum packed. We recommend that on unpacking you leave the meat uncovered in a cool place to ‘breathe’ for a couple of hours before cooking. It is possible to supply quantities of beef to order ‘un-wrapped’ for the restaurant trade. *Marbling is the fine pattern of fat within the lean beef which maintains its moisture during cooking and greatly enhances its flavour. Anthem and her first calf, Jack, adopted as our logo.